Cathal Sheridan is one of three players to sign new deals. CATHAL SHERIDAN, JAMES Cronin and John Ryan have all signed new contracts with Munster. The trio of former academy players have agreed to stay with the province until at least June 2016, with these new deals coming in the wake of several highly promising performances. Sheridan stepped up to the Heineken Cup mark in impressive fashion last month with an assured display in the dramatic victory away to Perpignan. The Sligo native made his Munster debut in February 2013 and will line out for the province for the 20th time against Ulster this evening. Cronin has enjoyed his breakthrough this season, making 14 appearances and scoring three tries. The 23-year-old was another convincing starter in the victory against Perpignan, and looks like providing stiff competition for Dave Kilcoyne for both the immediate and long-term future. 25-year-old Ryan has been something of a slow-burner but is showing his true ability this season, with three starts in seven appearances pointing to Rob Penney’s trust. 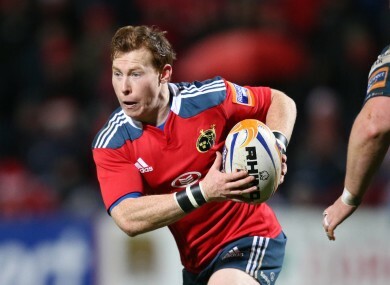 The Cork man made his Munster bow back in September 2011 and joined London Irish on a short loan stint in 2012. Penney has welcomed the confirmation that all three players have agreed to extend their time with the province. The fact that all three men featured in the All-Ireland League in recent season offers encouragement to young players currently on the club scene and hoping for a professional future. Sheridan was superb for Limerick side UL Bohemians over the last number of years, while Cronin [Dolphin] and Ryan [UCC and Cork Con] also impressed domestically. Email “New Munster deals for Sheridan, Cronin and Ryan”. Feedback on “New Munster deals for Sheridan, Cronin and Ryan”.